Veneers are thin, custom-made shells made from tooth-colored materials (such as porcelain) designed to cover the front side of your teeth. To prepare for veneers, your doctor will create a unique model of your teeth. This model is sent to a dental technician who creates your veneers. Before placing your new veneer, your doctor will need to conservatively prepare your tooth to achieve the desired aesthetic result. 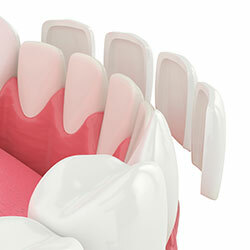 When your veneers are placed, you'll be pleased to see that they look like natural teeth. While veneers are stain-resistant, your doctor may recommend that you avoid coffee, tea, red wine, and tobacco to maintain the beauty of your new smile.